Survey is the next major hurdle and absolutely essential. Even for an experienced yachtsman, a time-served boat-builder and with money to spare we are all prone to an attack of starry-eyes. But get it all down in black and white by an independent observer, good points as well as bad, and hopefully your feet will come back on dry land and you will make the right purchase. However the whole business of surveys has potential for controversy and is a subject for another time. As well as confirming your hopes on the condition of the boat an insurer will require a recent survey report to encourage him to take on the risk. There is no legal requirement to insure a boat but most ports and inland waters have local bye-laws obliging at least Third Party and rather ominously, Removal of Wreck. Yes, it does happen as it did in Dartmouth last year when a much-travelled, well known boat sank on her mooring, quietly and all by herself one night and the cost of raising her from just 30’ was eye-watering. I often think that too much emphasis is given to the condition of the boat and not enough to the skipper. 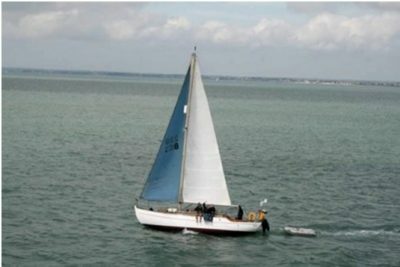 Give a fool a good boat and he will sink it but give an experienced sailor a wreck and he will get it home in one piece. Remember to have your insurance in place when you take possession. If you are going to have a problem it will probably be the first time you let go the mooring! However again, insurance is a subject for another discussion.